At Edmonton, Alberta, on this day in 1915, George’s eldest brother, the architect Alfred Merigon Calderon (q.v. ), applied to join the Canadian Overseas Expeditionary Force — as their youngest brother, Frederick Elwyn, had on 23 September 1914. It is not clear whether Fred (q.v.) was by now on the Western Front, or whether he was still a reservist in Britain and staying with his mother Clara in London on weekend leave. Had Fred, or Clara, telegrammed Alfred to tell him that George was ‘wounded’? Had this affected in any way his decision to sign up for active service? In fact, before they emigrated to Canada both Frederick and Alfred Calderon appear to have served many years in the Middlesex Rifles as cadets and by 1915 Alfred had been a commissioned officer with the 66th Canadian Battalion for about a decade. There was a considerable difference in their ages, however: in 1915 Fred was 41 and Alfred Merigon 54… In other words, in the Attestation above Alfred had falsified his age by ten years! This is not the only interesting thing about the above form. It looks as though he completed it using a typewriter. In answer to the question ‘What is your religion?’ he had typed ‘Yes’, but had to correct it longhand to ‘Church of England’. Perhaps he was influenced here by his father’s flippant attitude to religion: in the 1881 census Philip Hermogenes Calderon, who was well known for his theatrical impersonations, had prefixed his name with ‘Bishop’. 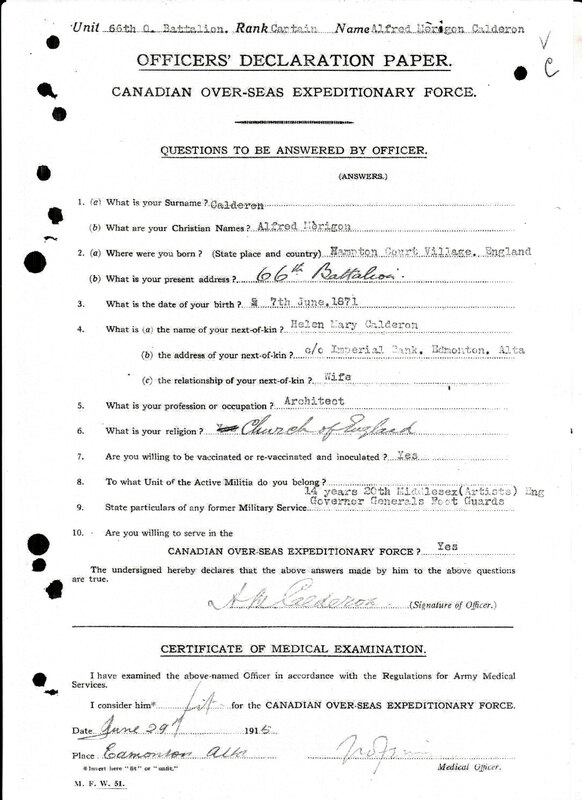 Alfred Calderon fought on the Western Front for three years with the 1st Battalion, Edmonton Regiment, and seems to have returned to Canada in 1919 with a distinguished service medal and the rank of Captain. Fred Calderon, who had visited George in hospital in London in November 1914, and to whom George was particularly close (see my post of 1 November 2014), was killed by a sniper at Ypres on 3 April 1916 and is buried at Zillebeke (q.v. ), not more than a couple of miles from where George was wounded on 29 October 1914. Both Alfred and Fred can be seen on the family photograph illustrating my post of 27 September 2014. This entry was posted in George Calderon, Timeline and tagged Alfred Merigon Calderon, Canada, Canadian Overseas Expeditionary Force, census, Clara Calderon, Edmonton Regiment, Fred Calderon, Frederick Calderon, George Calderon, Middlesex Rifles, Philip Hermogenes Calderon, The Great War, World War I, Ypres, Zillebeke. Bookmark the permalink.